Dozens of youngsters had an ace time at a tennis lesson with a difference yesterday. 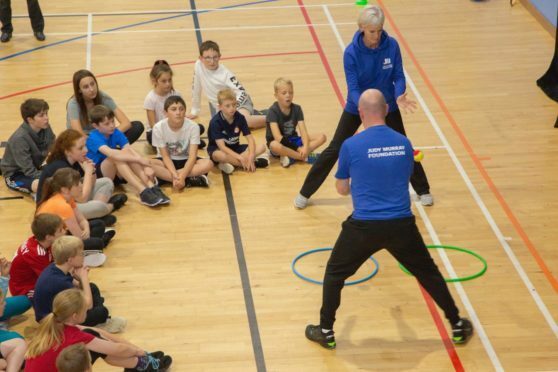 Judy Murray, renowned coach and mother of superstars Sir Andy and Jamie, headed up a workshop for 30 primary school children at Garioch Sports Centre on Tuesday. The sessions, which were organised by her foundation, were designed to boost tennis in the area. One was aimed at the children and included activities like balloon tennis, which utilises skills such as rhythm and timing. A second lesson was given to prospective coaches interested in helping youngsters in the area learn the sport. Kevin Bonarius, co-general manager at Garioch Sports Centre, said: “We were delighted to welcome Judy Murray and Kris Soutar from the Judy Murray Foundation to deliver our coaching workshops. “The children and coaches enjoyed fun, action-packed sessions designed to develop the all-important skills required for playing tennis. “Developing the network of coaches and activity in the area is our priority with our ambitions to build a 3-court indoor facility here at the centre.